Ben Johnson is the founder of Bixelcog LLC, an iOS development company in Lancaster, PA.
Ben Johnson, born November 9, 1988, grew up in Lancaster, PA. He graduated from Hempfield High School in June 2007. At Hempfield he earned four varsity letters in tennis, played oboe in the concert band, and was co-editor-in-chief of the newspaper. 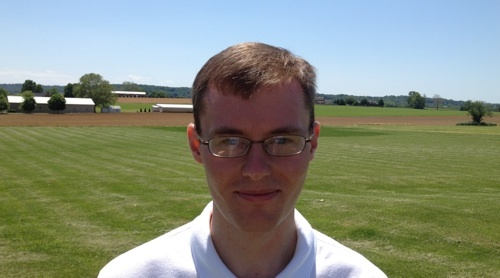 He completed his undergraduate studies at Elizabethtown College in three years, graduating with a BS in mathematics with a second major in economics and a minor in Spanish. After passing actuarial exam FM (financial mathematics), Ben interned with the actuarial department of Arch Insurance in New York, NY during the summer of 2009. Upon graduation from Elizabethtown College, Ben began graduate school at the University of North Carolina at Chapel Hill. He graduated with an MS in economics in December 2011. At UNC, he studied applied microeconomics and wrote a Master’s paper titled “Student Debt: Who Borrows?”. He took courses in health economics, labor economics, empirical industrial organization, and econometrics. He released his first iPhone app, Baseliner, in August 2012. Baseliner keeps a record of the user’s tennis matches. Users can add an opponent, score, date, and location to each match. Users can keep track of their wins and losses against each particular opponent. The app interfaces with Twitter to allow users to tweet the results of their matches and with Dropbox to allow users to export their information from Baseliner into Dropbox.